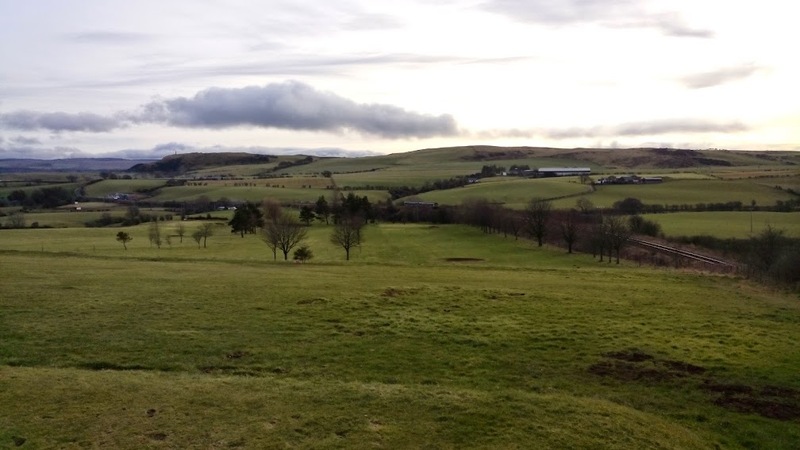 I’ve talked elsewhere about the great membership deals you can get with South Ayrshire Golf which let you play a variety of courses around the county. One of the lesser known ones is this one, Maybole. On the face of it it doesn’t sound like a great place to play golf but I really like it. I will talk more about why I like and I will describe the course to you and maybe you will feel like playing there too? 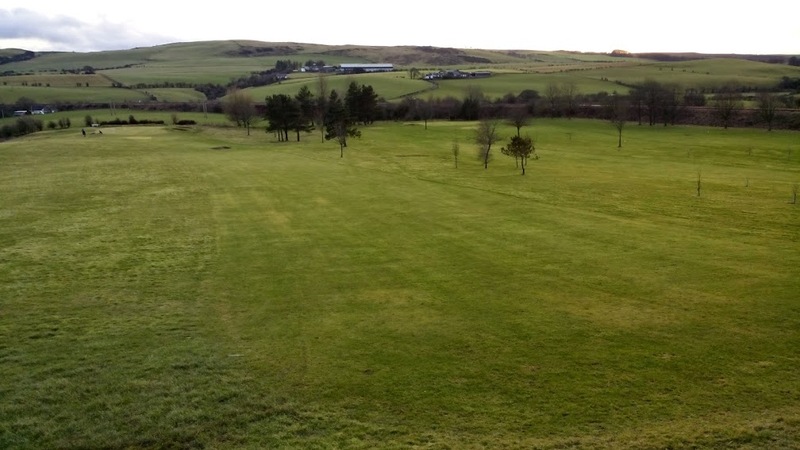 Maybole Golf Course is to be found at the south end of the town, next to the swimming pool. There is a clubhouse but as far as I’m aware it is no longer used so when you arrive you should go to the pool to check in and get your game ticket. 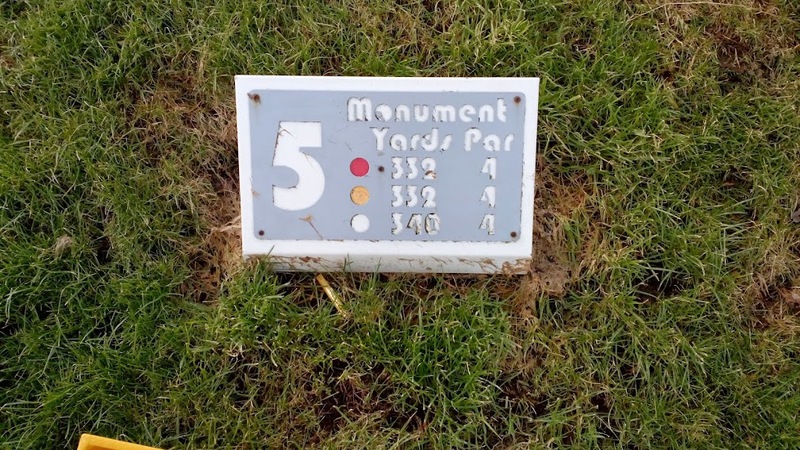 It is a relatively short (no par 5s) nine hole course basically built on the side of a hill. Seeing as there are only nine of them, I think I will just talk my way through the holes in sequence. With a tail wind and a long drive, the green might be reachable in one but for me today I ended up just behind the trees on the LHS and had a shortish iron shot on. Nice start to the round, playing off an elevated tee is something I always enjoy. Of course, what comes down must go up. And the next hole is back up the hill you just played down. 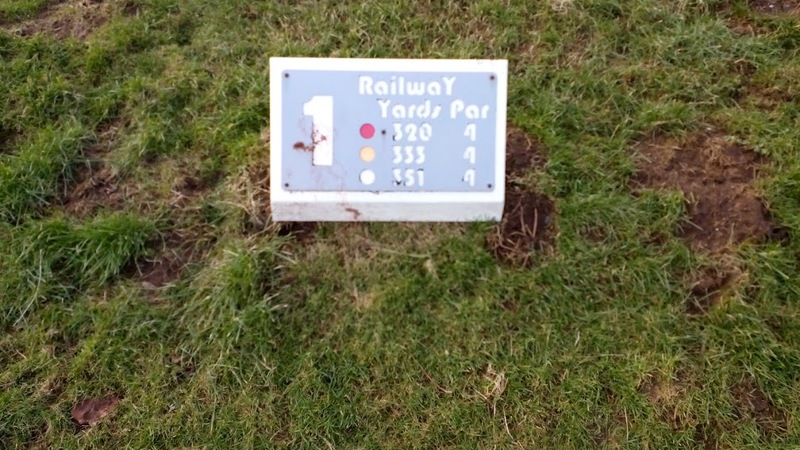 There is a ditch that traverses this side of the course and if you can get up near that you are still faced with a blind iron shot up ower the raise. 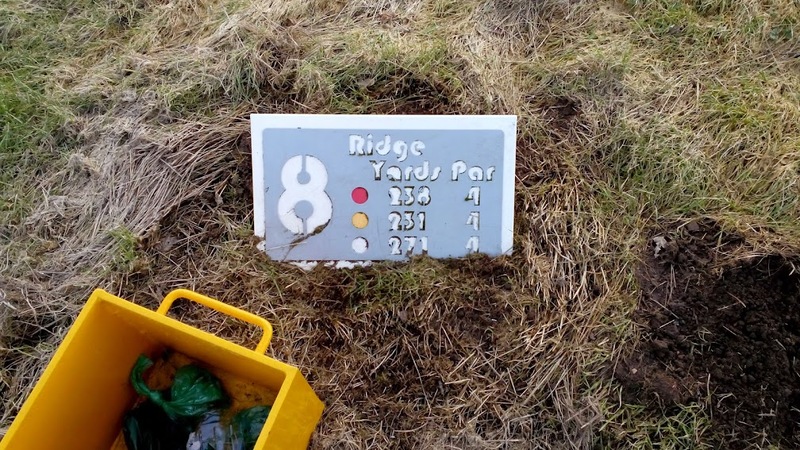 If you’ve played the course a couple of times you will know where to play but for the first time you’ll want to walk the hole or have some kind of mapping app to guide you. 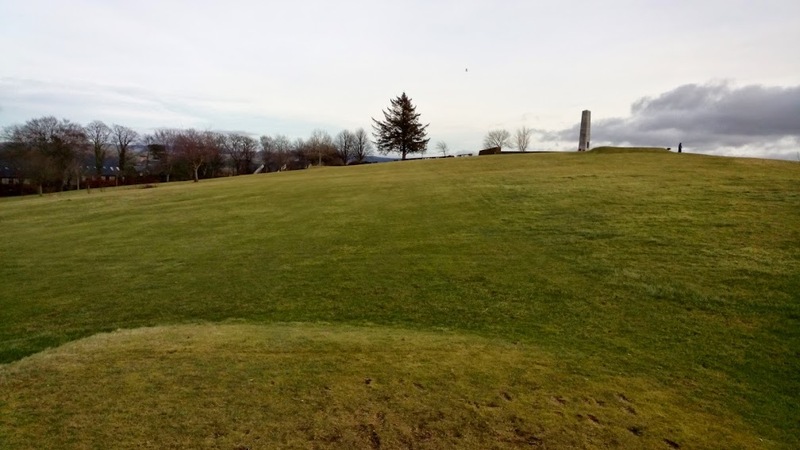 Once you get up and ower the hill there is a relatively straightforward green, although like almost all greens on this course it is not level and has a slope. The third is quite a tricky par 3. At just under 200 yards it is quite long. 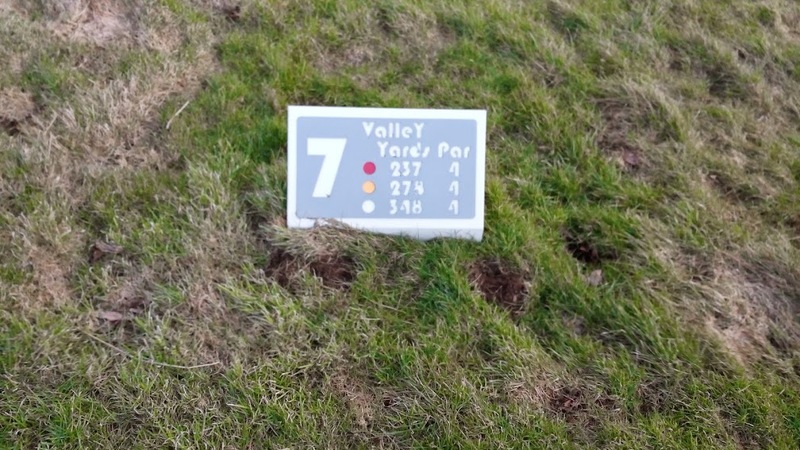 The fairway plays back across the hill so there is a distinct R >>> L camber on the hole which can take your ball for a wee ride if you’re not careful. 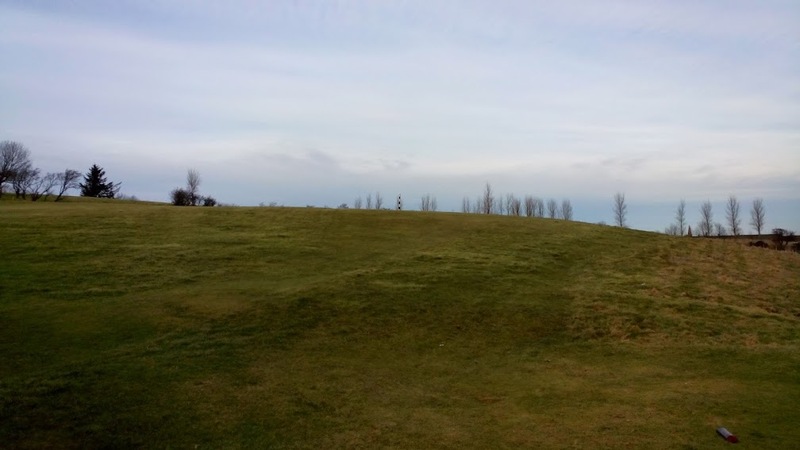 This is the view from today’s tee (it was slightly further forward than summer tees would be and the green is a winter one so the hole was a bit shorter today all round). You can see the normal green behind today’s flag here. 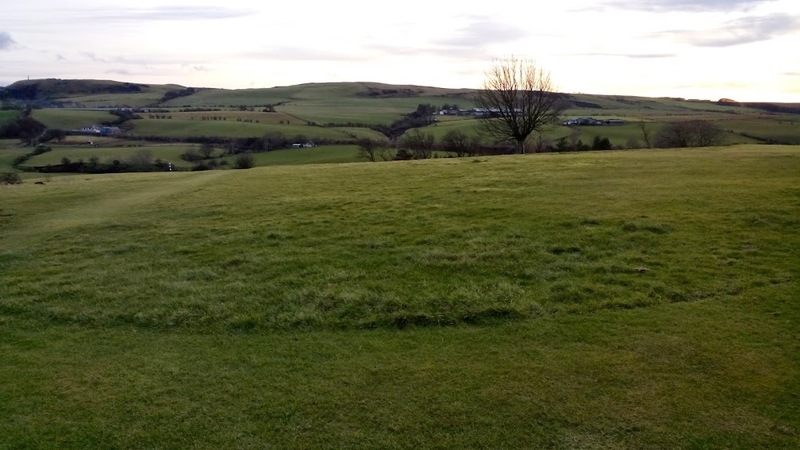 I was a bit disappointed that this hole (most were not winter greens) didn’t have its usual green as I like the way it is dug into the slope of the hill. The fourth is, you guessed it, back down the hill! 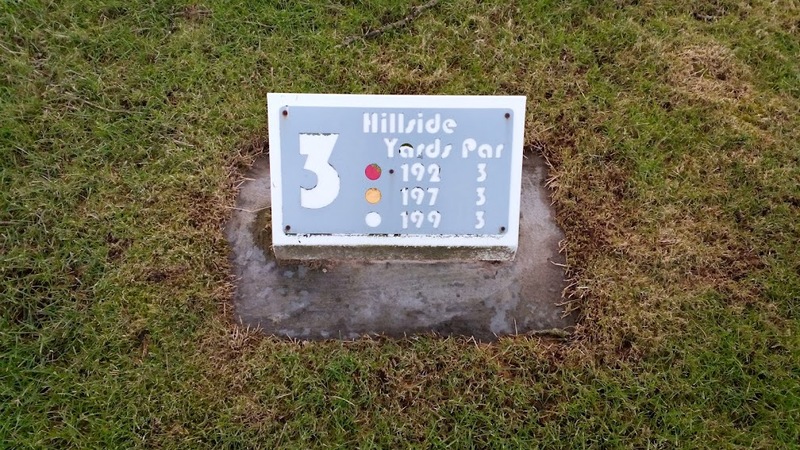 As the name of the hole suggests, you are playing up to that monument at the top of the hill. I didn’t look at it but I presume it is for the war dead of the town in one of the world wars last century. 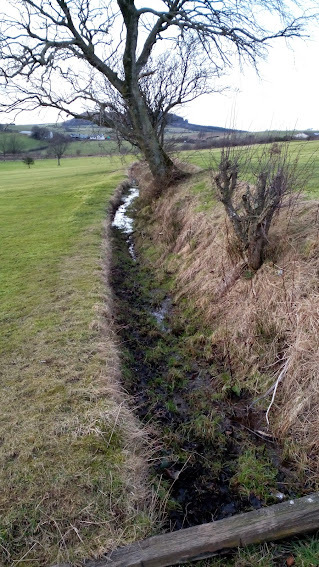 This is the ditch I mentioned earlier. On this hole it is the fourth, and penultimate, time you cross it. This hole plays really like the second with a decent tee shot still leaving you with a tricky blind second to get on/ near the green. The first time I played this course last summer, I had to walk halfway down to the green before I could figure out the lie of the land. 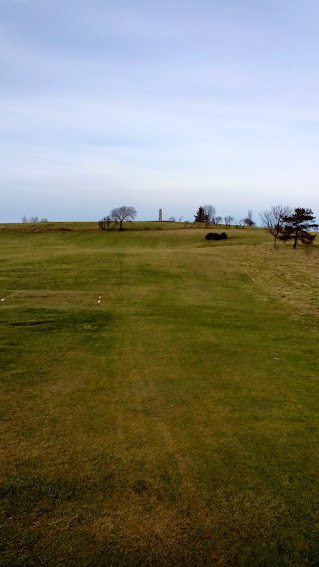 Once you get down the slope, there is actually a reasonably generous bit of fairway playing down to the green but you really wouldn’t know from the tee. If, like me, you don’t reach the green with your tee shot, you have quite an awkward chip on, down the slope of the hill. It needs to be very delicate as your ball will run! The eight is quite short but again you can’t see the flag from the tee. 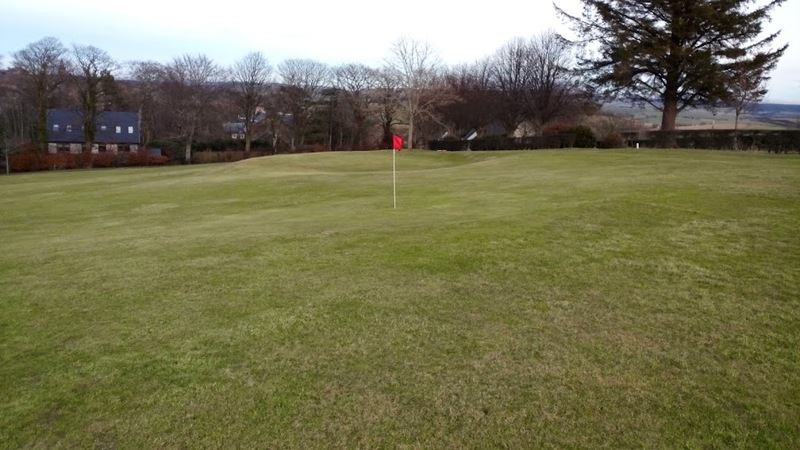 It is guarded by a stand of trees which hide the wee kick to the right at the end of the fairway. 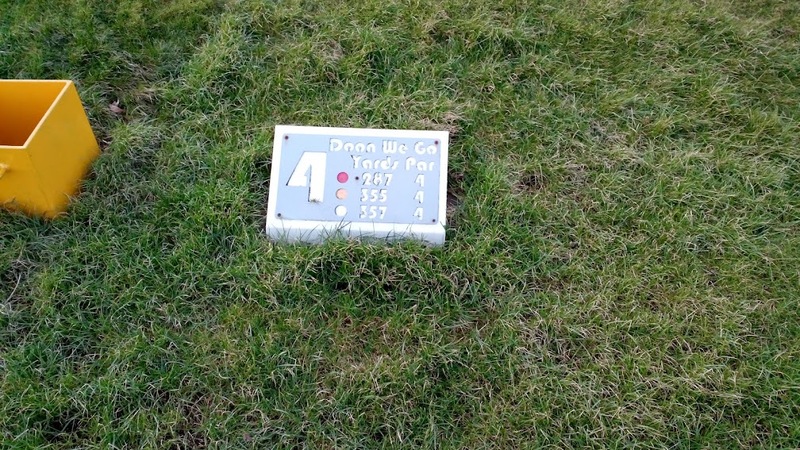 A straight tee shot will give you a relatively short and not too challenging iron on. Today, I sliced my drive and ended up on the hard right of the fairway with no line of sight to the green so needed three on! To finish is a really cool par 3. The tee is higher than the green so you play down and slightly to the right. 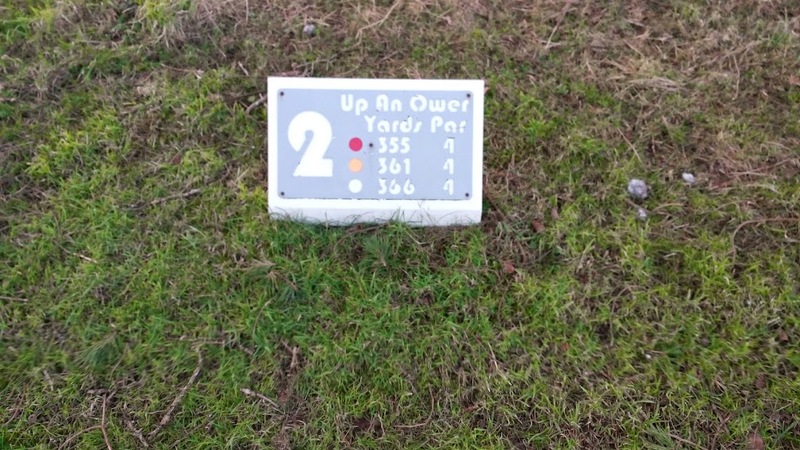 It is the easiest of the three par 3s on the course but still a bit of a challenge; to hit the green you will need an accurate tee shot although you will probably be playing a shortish iron so very much the best birdie opportunity of the course’s short holes. 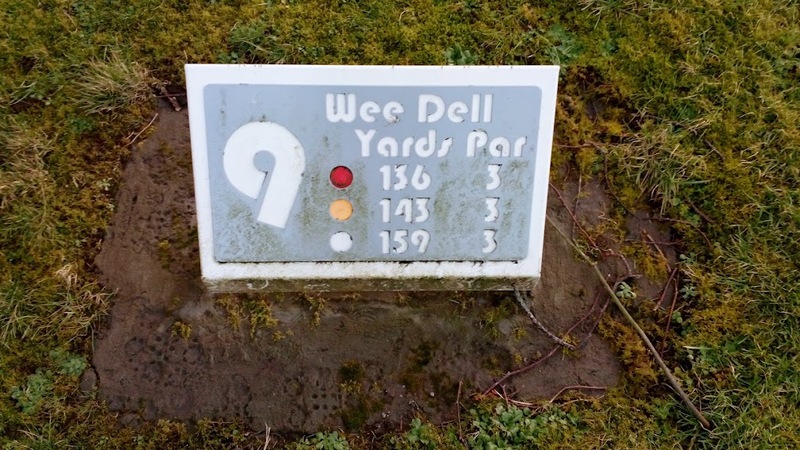 Considering that South Ayrshire has the Belleisle and Troon course to offer, it is not surprising that Maybole is overlooked. And, of course, being a nine holer it will not give enough golf to many. 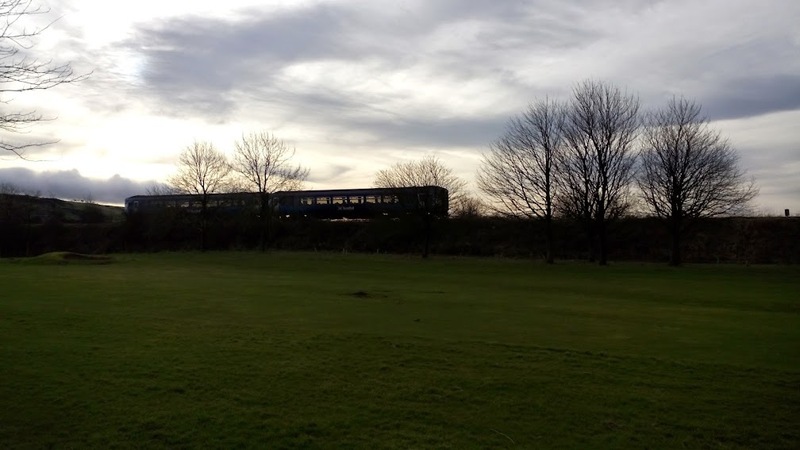 For me today it was ideal – I had a window of a couple of hours to get out and if I had tried to play a full course I would probably have run out of daylight. There is just something about Maybole I really like though. 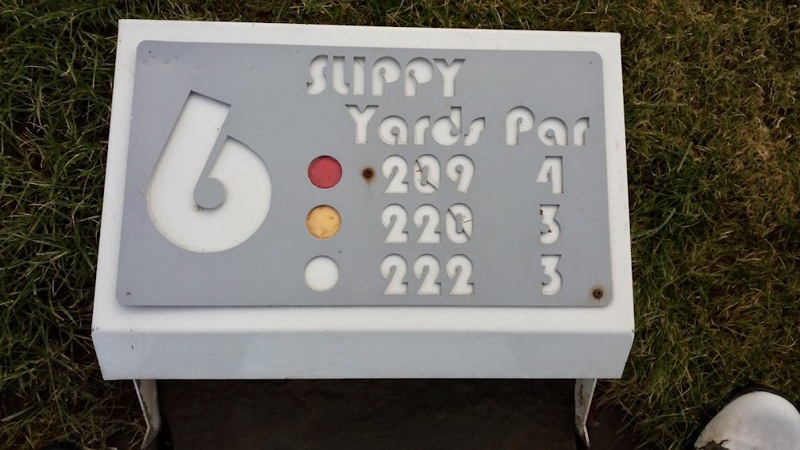 It is the total antithesis of golf as it is played in many countries and the image many non golfers have of our sport – big swanky clubhouse, artificial landscapes that cost a small fortune to be allowed upon, played by rich, white middle aged men. It is very “rough and ready”. There’s the odd dog walker, some of the greens are quite scruffy (I think I was the only person today who repaired their pitchmarks…) and there was some litter at some of the teeboxes. But, to me it represents the grassroots of golf. You don’t need to be on an executive salary to play here and you most certainly do not get a buggy to drive around in. 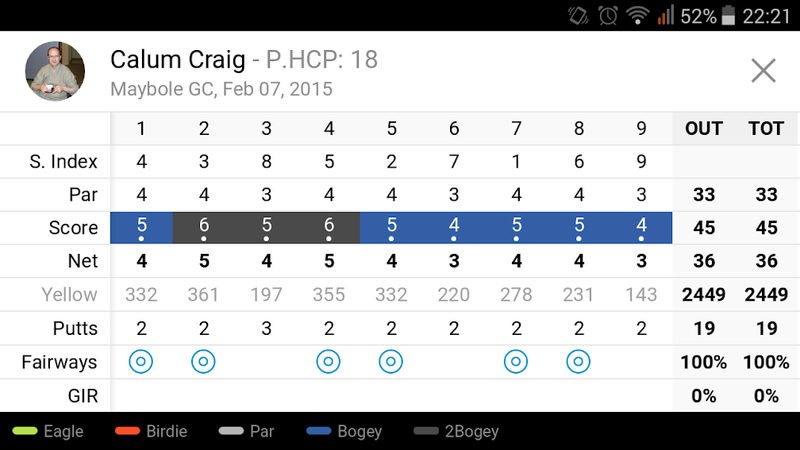 You take your clubs and you walk around some hills for an hour and a half or so and you play golf. No frills golf I guess you could call it. Considering we invented the game, I guess it is natural that we have access to golf in Scotland that many other places don’t but we are lucky. 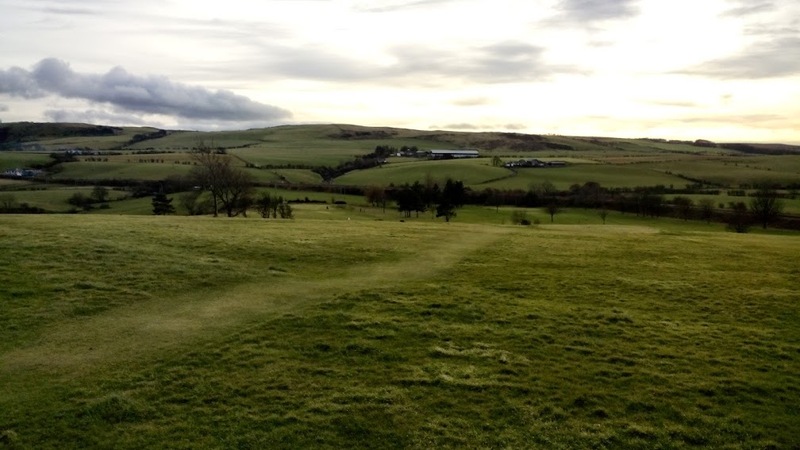 Golf in Scotland, and South Ayrshire, is accessible, the courses are enjoyable and it doesn’t cost a fortune. A winning combination if you ask me.